Sometimes we just don’t want leave the house but we want our favorite craft beers, amiright? Now, thanks to PicoBrew you can brew your own beer of your favorite brews. 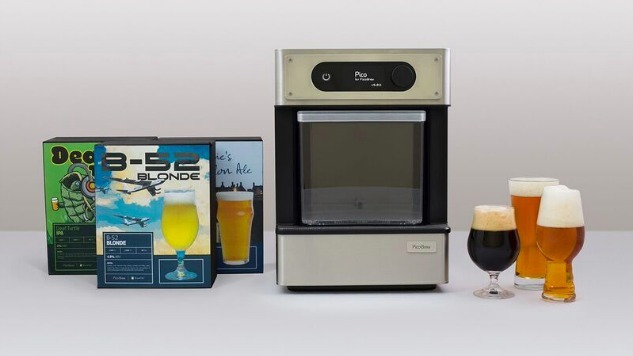 This year at the Consumer Electronics Show in Las Vegas, the company debuted their homebrewing system capable of making a number of popular brews right on your countertop, and fast. PicoBrew was originally on Kickstarter. They had another homebrewing system called Zymatic. This version however lets you brew specific brews along with creating your own recipes. Even better, the breweries are allowing PicoBrew and you make their beer at home rather than getting upset that you aren’t buying their bottles from the store. The brewery earns a royalty of the sale, and you get your beer. Big names in craft beer such as Rogue, 21st Amendment, and Abita have already signed up. PicoBrew is currently accepting preorders, with plans to ship some of its first orders in May. The device retails for $699.